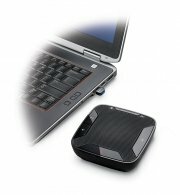 The perfect tool for impromptu conference calls, the Plantronics Calisto 620 is a portable wireless UC speakerphone that instantly transforms your laptop or smartphone into a high-quality conferencing device. Offering unmatched audio clarity, the Calisto 620 features 360° full- duplex audio and Bi-directional microphones that activate in the direction of the speaker's voice so callers hear you—not your background. PC wideband audio and Digital Signal Processing (DSP) reduce drop-outs and echo with Acoustic Echo Canceller. Integrated A2DP lets you listen to streaming media from your mobile device, including your favorite songs, podcasts and more. Bluetooth mini USB adapter — for always-ready PC connectivity. Bi-directional microphones — activate in the direction of the speaker's voice, so callers hear whoever is speaking, not background noise. Integrated A2DP — lets you listen to streaming media from your mobile device. Up to 7 hours of talk time — and 5 days standby time.